The Party was held at the Old Spaghetti Factory in Tacoma. It gave Grand Prix finishers recognition for their efforts during the 2012-13 season. Bruce “Flash” Fisher – photography. You can click on any photo for enlargement. You can have your photo (free) by request. After the opening introduction, Jerry introduced two of the sponsors present. 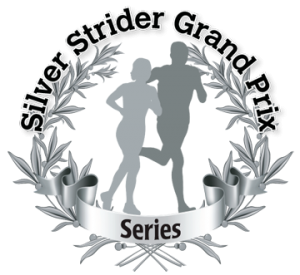 First to be introduced was Miguel Galena of Route 16 Running in Gig Harbor, sponsor of Silver Strider Articles online. The second introduction was Tony Phillippi of the Tacoma City Marathon Association, co sponsor of the Grand Prix Series. Also given recognition were, South Sound Running, Shoes ‘n Feet in Bellevue, The Balanced Athlete in Renton, super jock ‘n jill in Seattle, Sound Sports in Seattle, Plateau Runner in Sammamish, West Seattle Runner, and Fleet Feet Sports in Tacoma and Bonney Lake. Introduced next were the individuals who sponsored the trophies. Susan and Dale Hall, Dave and Charlea Sherman, Audrey Kirkwood, and Laurie and Steve Carley. The South Sound Running Top IO “Runner Of The Year”. 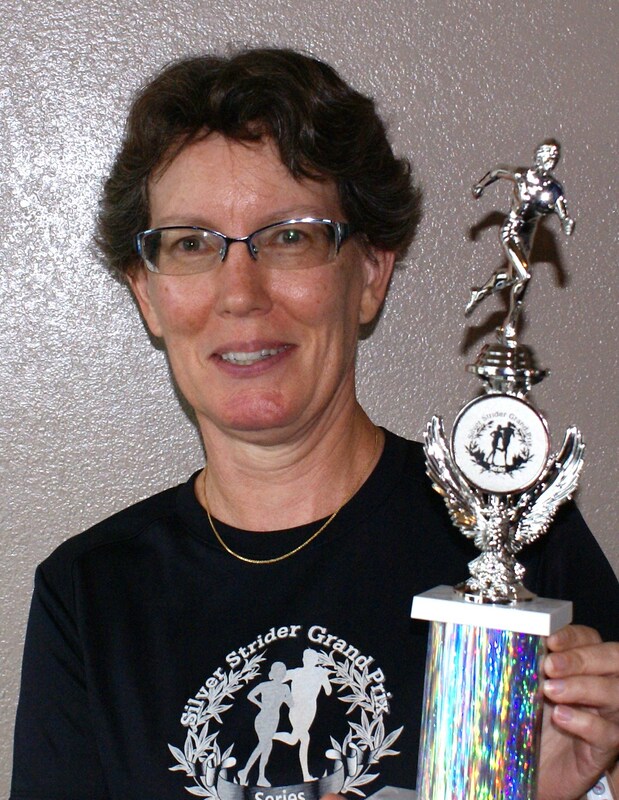 The first honoree was Judy Fisher who posted world class times for the 5k, 10k and half marathon on her way to being selected as the female “Runner Of The Year” for 2012. Judy was the only runner in the state to post world class times at 3 distances. 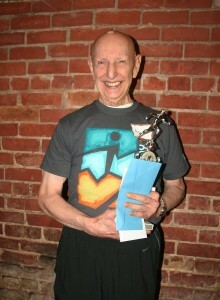 Bill Iffrig was the recipient of the male “Runner Of The Year” award. Bill dominated the TOP IO rankings by being ranked #1 for all four distances. The 5k, 10k, half marathon, and marathon. He received special praise for his marathon, timed in 3 hours and 50 minutes, at age 78. The Grand Prix awards were next. 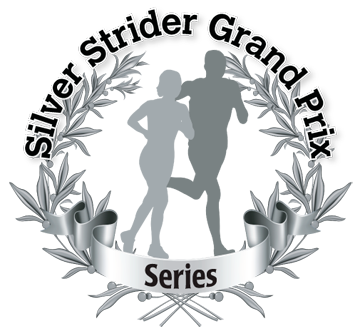 Each finisher received a Silver Strider Grand Prix Series trophy, engraved with their name on the award, as well as a free entry into an upcoming race. In addition, every finisher received a gift certificate to a running store. The first 19 runners to be honored were first time finishers. This was a sizable increase over last year. This group included our oldest finisher Chloe Parr. The additional prize drawings were plentiful. “Lucky” Richard Olafson wins again! Gift certificates for prize drawings were donated by; NW Trek Wildlife Park, BeHive Massage Therapy, Azteca Restaurant, JoeSeppi’s Italian Restaurant, The Old Spaghetti Factory, Gateway To India Restaurant, Alfred’s Cafe, Forza Coffee – Tacoma, Moctezuma’s Mexican Restaurant, Fleet Feet Sports, RoadRunner Sports, Route 16 Running & Walking in Gig Harbor, Shoes ‘n Feet in Bellevue, and Plateau Runner. A “Day at the Races” gift certificate was donated by Audrey Kirkwood compliments of Emerald Downs. The Grand Prize was an overnight stay in a jacuzzi, fireplace, suite at the Wesley Inn of Gig Harbor. The next runners recognized were the repeat finishers. Those who finished 8 or more race for two consecutive years. There were 14 finishers in this category. The last group honored were the 3-peat finishers. Runners and walkers who finished 8 or more races all three years that the Grand Prix series has been held. There were eight 3-peat finishers. The recipients of the Achievement Awards were announced. First Female to reach 80 points was 3-peat finisher Jean Cornwell. Winning this honor for the 3rd straight year. Jean also finished first in the W70-74 age group for the 3rd year in a row. In addition to a pair of shoes, a free race entry, and the Series trophy, Jean received a $50 gift certificate for being the first woman to reach 80 points. First Male to reach 80 points was Jerry Dietrich for the 2nd straight year. Jerry also finished first in the M75-79 age group for the 3rd straight year. He received the Series finisher trophy. “Most Races – Male” was won by Dave Sherman. Dave won the title, “Mr Grand Prix”, for completing 17 races. Along with a pair of shoes, the Series trophy, and a free race entry, Dave received a $50 gift certificate for completing the “Most Races”. 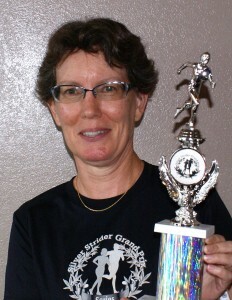 “Most Races – Female” was won by Marsha Murray who finished with an amazing 20 out of 23 races. She was named “Miss Grand Prix – 2013”. She received the Series trophy, a free race entry, and a gift certificate. Marsha also received a second $50 gift certificate for completing the most races. The new Grand Prix Series men’s and women’s shirts were unveiled at the party. The shirts can be ordered by email (jerry@silverstrider.com). Available in both Men’s and Women’s small, medium, large, and x-large. Cotton or Tech. Proceeds from shirt donations will go toward the Grand Prix awards 2014.